Hydrogen fuel cells offer great promise as an alternative source of electricity to power vehicles, buildings and even portable electronic devices. Researchers at the University of Wyoming are at the forefront in looking for ways to make fuel cell technology more efficient and cost-effective while remaining environmentally friendly. Guided by Assistant Professor Brian Leonard in UW’s Department of Chemistry, Ph.D. student Yagya Regmi is exploring the use of combinations of metals other than platinum to serve as fuel cell catalysts. 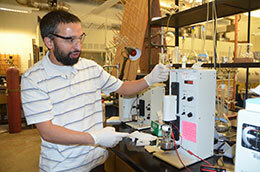 The research has the potential to significantly reduce the cost of such catalysts while improving their effectiveness. Regmi, a native of Nepal, is one of about two dozen UW graduate students studying through the UW School of Energy Resources’ competitive graduate assistantship program, which attracts students from across the globe to conduct energy research. After a little over four years at UW, he is scheduled to complete his research and receive his Ph.D. in chemistry in spring 2015. Fuel cells combine hydrogen and oxygen to produce electricity and heat, with water as the only byproduct. Catalysts are needed to stimulate that chemical reaction, and the most commonly used catalyst material is platinum nanoparticles. However, platinum is an expensive precious metal, and it sometimes degrades and loses its effectiveness, limiting the lifetime of fuel cells. Regmi has been experimenting with other types of metals, including molybdenum and tungsten, combined with carbon, to serve as fuel cell catalysts. He also has combined more common metals, such as iron, cobalt and nickel, with tungsten and molybdenum to create bimetallic carbide crystals as alternative catalysts. The goal is to not only reduce the cost of the fuel cells by eliminating some or all of the precious metals, but also improve the efficiency and stability of the catalyst. The first two and a half years of Regmi’s work involved developing a method to produce the catalysts in Leonard’s lab on the fourth floor of UW’s Physical Sciences Building. For the last year and a half, he has been testing their effectiveness for fuel cell reactions. While he hasn’t yet developed catalysts that are as active as platinum, he has made headway in improving their production and design. Working with this limited set of metals, Regmi has barely scratched the surface. He believes there is a still-to-be-discovered “sweet spot” of the proper combination of metals and carbon to form crystals that would create a catalyst preferable to platinum. In fact, there’s potential for hundreds of different multimetallic carbides nanoparticles that could be tested as fuel cell catalysts. In the meantime, the drive toward hydrogen as a commercial energy source continues worldwide, in part because the process doesn’t produce carbon dioxide, a greenhouse gas, as a byproduct. Honda and Toyota recently unveiled vehicles powered by fuel cells, and other companies are expected to follow. Hydrogen filling stations for vehicles are popping up in California. In addition, fuel cell technology to charge cell phones and laptop computers is nearing commercial launch, and fuel cells are expected to be able to power individual homes and other buildings in the not-too-distant future. It remains to be seen if fuel cells will reach a level of efficiency to compete economically with other power sources, but Leonard says research such as his and Regmi’s is almost certain to advance the technology. Leonard, who came to UW four years ago after earning his Ph.D. at Texas A&M University and doing postdoctoral work at Cornell University, intends to continue the research. Regmi, meanwhile, expects to find a job in industry after he receives his Ph.D. from UW, but would like to eventually return to academia as a researcher or teacher in the field of renewable energy.